Did you know there were 6,206 calls to the Center for Hope & Safety Hotline in 2016? These calls are from our neighbors, people just like us who are victims of domestic violence and have no place to go. Imagine for just a moment being so afraid to go home that you will sleep on the street with your children. That is what The Center for Hope and Safety is all about: providing that place to stay at any time of the day or night. 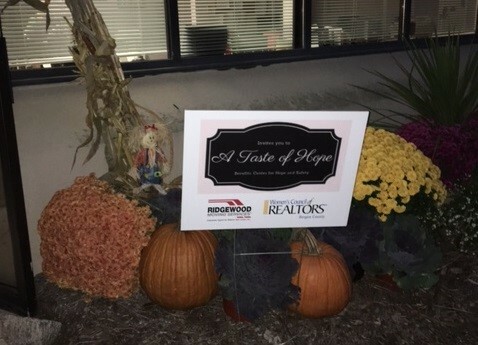 With the generosity of so many in the business community, over $4,000 was raised at the A Taste for Hope event last Thursday, October 19, 2017. Sponsored by Ridgewood Moving and the Council of Women Realtors Bergen County, this fundraiser attracted well over 100 attendees for a night of camaraderie and shared purpose. Now, it’s time to thank all those who provided the food and drink for the event. Without their participation this would not have been as successful. Food Donations – A HUGE THANK YOU to the following restaurants. Also a special thank you to Baviello Landscaping and M & C Garden Flowers for the flowers, haystacks and pumpkins they provided to decorate the venue. Also to the Shopping Vendors: Aishlinn Bila of Pampered Chef, Jamie Polman of LuLaRoe, Lauren Gehm of DoTerra Scented Oils, and Kathy Gittleman of Keep Collections Jewelry. Their hotline is always available, ready for your call, 24 hours a day. If you ever need their help, call them at 201-944-9600. If you want to know if you can help in any way, you can reach them at (201) 498-9247.